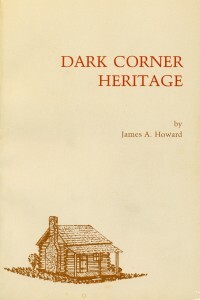 Dr. James A. Howard, Dark Corner native and well-known Baptist minister and administrator, was the unofficial historian of the area. He is a direct descendent of Captain Thomas Howard of the Battle of Round Mountain fame. He had said for many years that he would like to write a book on the Corner. The only published work on the immediate area had been the Rev. J. Dean Crain’s memoir, A Mountain Boy’s Life Story, published by the Baptist Courier in 1915, which had long been out of print. Dr. John B.O. Landrum had made numerous references to the Dark Corner in his Colonial and Revolutionary History of Upper South Carolina, published in 1897. In 1980, I encouraged Jim to gather his years of notes and memories and write a definitive book on the heritage of this region. His wife, Ruth, had a heart attack that year, so I assisted him with editing, photographs and illustrations for the book. He called it Dark Corner Heritage, and asked me to draw a picture of Captain Thomas Howard’s boyhood cabin for the cover. In appreciation of my efforts in publishing the book, and, he said, my personal devotion to continue telling the heritage as the Squire, he passed the mantle of Dark Corner historian to me in the last chapter. It was a humbling moment. I think the link to this particular John Portman is very unlikley. Perhaps there is some source information which would put the matter beyond doubt. I look forward to hearing from you. Sorry to be so long in replying to your question. I just last week found your request in a comment file that I had not entered in quite some time. My records on the Howard family indicate that Peter Howard first married Ann Portman. They had five children: Thomas, Portman, Jane, Lucinda and Matilda. Upon Ann’s death, Peter married her sister, Sarah. They had six children: Jane, Nancy, Matilda, Lucinda, and two sons, whose names are unknown. I enter the Mormon reference I have for Ann Portman, AFN: 1V4P-CN5, and found only that she married Peter Howard and is the mother of Thomas Howard. No other details were given. I have no other information on Ann or Sarah Portman, so I don’t know who their father was. I checked out the “Carter To Charlemagne” site and, like you, feel that this John Portman is not Ann or Sarah’s father. Sorry I could not have been of more help. fascinating post. I have been wondering regarding this issue,so thankfulness for posting. It was designed by a graphic artist from my list of things I wanted the website leading to my blog to cover. He has captured the essence of what the Dark Corner is, and my long association with its molding for the public.